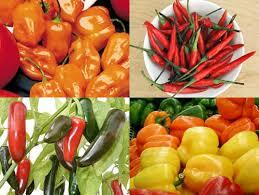 Deep Red, Orange and Green Peppers provide primarily MEDICINAL and HEALING benefits. They’re rich in VITAMIN C and ANTIOXIDANTS. They STIMULATE DIGESTION, RELIEVE PAIN and REDUCE BLOOD CLOTTING. Have a HEADACHE??? Sprinkle some Cayenne on your meal. Women: Experiencing HEAVY MENSTRUAL FLOW??? Add some Cayenne, Chili or other spicy pepper to a cup of warm Cocoa Tea. Young children naturally love that fresh, raw taste of sweet red bell peppers. 9 Things Women REALLY Should Know About Men: + 1 MORE to Grow On! All Rights Reserved by Motha Nature 2011. Awesome Inc. theme. Powered by Blogger.